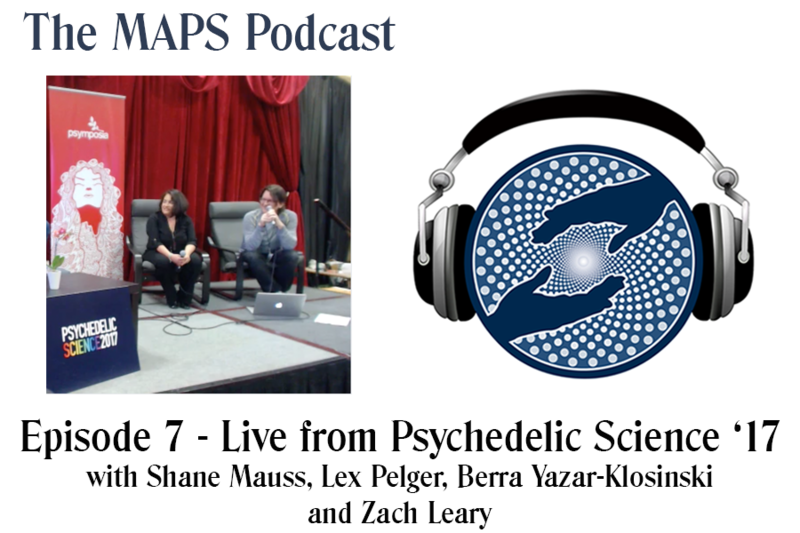 MAPS Podcast: Episode 7 - Live from Psychedelic Science '17! Episode 7 - Live from Psychedelic Science '17! This episode was recorded live at the Psychedelic Science '17 conference in Oakland, CA! It took place on the last day of the conference on the wildly fun and irreverent Psymposia Stage. Hosted by Zach Leary this round table discussion features the immense wisdom of Shane Mauss, Lex Pelger and Berra Yazar-Klosinkski. We took many twists and turns with topics ranging from a recap of the PS17 conference itself to the future of psychedelic research and some amazing insight into the cultural footprint around America concerning psychedelics. Both Shane and Lex spend lots of time taking their show on the road to everyday towns in America which affords them amazing insight into other points of view we might not otherwise consider. Berra from MAPS is the voice of reason here providing the audience with data and actual first hand accounts into the impact this research is having in actual patients. Enjoy the show!